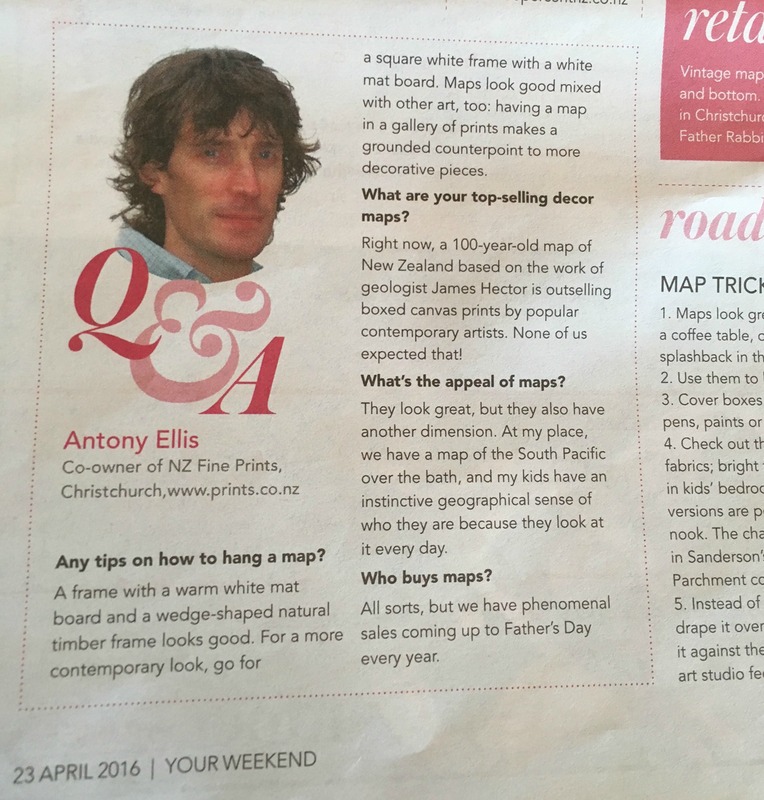 Maps as art in your home feature in "Weekend"
Over Anzac weekend there was an interview published by NZ House & Garden magazine editor Sally Duggan in Weekend magazine. 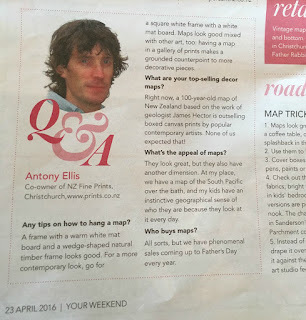 She spoke to Antony Ellis here at NZ Fine Prints about the trend for using maps in interior decoration. Below is the full transcript of the interview which has bit more detail than the edited version that appeared in the magazine. We have also illustrated this interview with a couple of the maps Antony mentions and of course linked to the actual maps that are for sale in our online catalogue. AE NZ Fine Prints have been NZ's specialist art print retailer since 1966, it's our 50th birthday this year! Back in the 1960s New Zealanders were becoming much more aware of our unique visual culture and naturally began looking to our own artists to decorate their homes and offices. 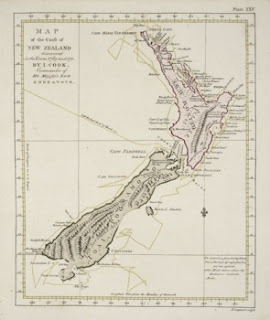 In 1969 it was the bicentenary of Cook's rediscovery of New Zealand, we published a large folio focussed on Cook's artists in the Pacific so we were publishing historical maps and charts almost right from the beginning. Until the earthquakes NZ Fine Prints were in characterful 1880s era double brick warehouses in Hereford St in central Christchurch, we spent over $100k trying to keep our much loved buildings together after the first quakes but this was a hopeless task after February. Our gallery was behind the cordon and under the tilting Grand Chancellor hotel so it was a couple of months before we were given just six hours to load all our prints into trucks and shipping containers. After a mammoth job of sorting everything we then transferred all our prints to our new stockroom in Cashmere. We would have gone straight back into the CBD but the government confiscated our land for the green frame and we now probably won't ever return to the central city as the internet is much more important than foot traffic for a nationally focussed business like ours and post-quakes Cashmere has become a very lively and convivial part of town to work in! SD What percentage of your business is online/remote sales vs instore sales? AE Because we'd always used mail order catalogues to reach customers outside of Christchurch the shift to online retail back in 1999 was an easy step, we now have hundreds of visitors to prints.co.nz each week and pretty much only see thrifty Christchurch customers who would like to save $6 on delivery in store. With 80,000 prints on shelves or framed in boxes for shipping it is not a very exciting retail experience if someone just wants to browse! Our largest markets are Auckland and Wellington followed by kiwis living overseas with a significant growth in Christchurch due to the rebuild - but only in the last 18 months as people nearly always leave buying new artworks til absolutely everything else in the home or office is finished. SD What proportion of your print sales are maps? Has this changed over the years? AE Maps are what's known as an "evergreen" product, consistently making up around 5% of the NZ print market year in year out with periodic spikes in interest. Before the most recent upsurge in maps' popularity sales last peaked during the America's Cup when it was held in NZ which created an interest in all things nautical. We always have a uptick in sales around Christmas but the big secret for map retailers is the phenomenal sales coming up to Father's Day each year, it's amazing how common your Dad's unique interest in old maps is! SD What are your top selling maps? Has this changed ? environment, we sell a lot of $29.95 posters that are simply pinned on the wall as a staff or student reference. But the majority of our maps are bought as wall decoration. But there is a dimension to a map that takes it beyond just being decorative. I have a map of the South Pacific above the bath at home, sure it's decorative but my 8 and 10 year old have an instinctive geographical centre to their sense of who they are just because they have looked at this map nearly every day of their lives. A map resonates and connects like this with the viewer over time, you value it more deeply the longer you have it as you invest more meaning simply by your changing relationship with the map, perhaps as a result of visiting some of the places on it or by learning more about the explorer's journey around the coastline. Maps are the super dependable gift, we have customers buying maps for the work leaving gifts nearly every day, for instance someone heading overseas after a stint at the NZ branch office. Also as soon as you get a lease on the flat in London Mum & Dad send a NZ map to remind you of home! The great thing from a business point of view is that guys who aren't "into art" at all are ok with maps. Maps are sometimes the only decoration a traditional kiwi guy feels comfortable getting enthusiastic about when it comes to choosing interior decoration! Sometimes we like to suggest having a map in the mix of prints for a house because they are a grounded counterpoint to fluffier frills and fripperies. A map will help balance interiors if all the other decoration choices are being made by the female half of a traditional household which still seems a surprisingly common practice. 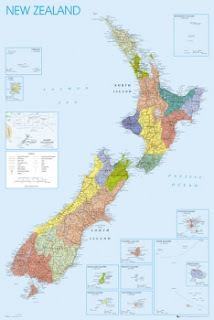 A map creates a sense of place, a context, and design wise a map or two sits happily with every style of interior decoration, if you look around every NZ home or office will have a place that's perfect for a map! ​SD Maps are turning up in all sorts of decorative incarnations (lampshades/ desk coverings etc). Do you sell maps to people for craft projects? AE Incredibly versatile printing technology is amazingly widespread in NZ and the capacity to produce far outstrips the demand for traditional printed products. There are printers making really creative products by printing on fabric, steel and wood, personally I'd be tempted by a rug that's a topographical map of the South Island, that would be pretty cool to look at and educational for the kids to boot. Although we sell maps designed to go on the wall we happily sell maps for use behind splashbacks or to be displayed under glass on a coffee table, other people cut old maps up to embed into decorative jewellery like brooches. SD Anything else interesting or diverting to tell me? most decorative are by the Italian map-maker Antonio Zatta and the French Cassini family of atlas publishers, illustrated with tiny scenes or vignettes that are sometimes wildly fanciful depictions of New Zealand by someone who is relying on second hand accounts of what NZ and its people were actually like! The most popular map from Cook's voyages has always been the "Bayly" version [shown at right], it's not that decorative (it doesn't even have a decorative title or emblem which are known as cartouche) but all the place names are in English & Maori, it's accessible. We recommend having a map framed with a warm white mat board and a natural colour timber frame, a wedge shape frame is traditional, or go for a square white frame with a white mat if you have a contemporary interior design. Either way a map will give you decades of enjoyment in a multiplicity of settings as you move house or office over they years which means they are ridiculously great value. Maps are a very social artwork - they give people something to look at together and chat about for a few minutes! An art work that can help break the ice between people who don't each other well because location and history will either be something they have in common or a starter for ten about where they come from. Aside from decoration maps are a uniquely functional artwork, you can put a map in a specific space to serve a practical purpose. A detailed map absorbs people's attention for a few minutes while they wait at reception, or by the bar or in the loo! SD I think this is everything I need! Many many thanks Antony. Will call later if I think of anything else.